Welcome to James's Canal Pages! 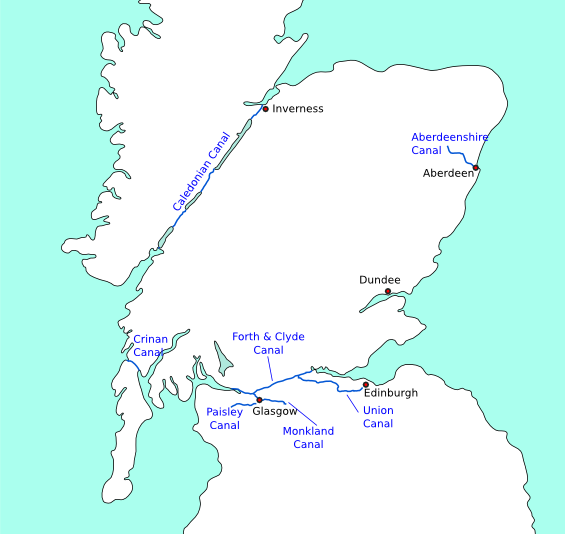 This is a site primarily about the canals of Scotland and mostly centred around the lowland canals. It isn't affiliated with any particular group or organisation and exists just to provide information on these waterways to anyone who's interested. Currently this new site is in its very early stages and really only has information on the Union and Forth and Clyde canals and a small-ish photo gallery. But keep checking back as I intend to add more content regularly. Android app released! I have recently released a guide to the Forth and Clyde and Union Canals as an app for Android devices. Please see this page for more details. The Helix Project is underway! Click here for information and photos of this exciting development on the Forth and Clyde. The map below shows the locations of the major canals. You can click on them to get more detailed information on each. The canals have a lot to offer, from the stunning scenery surrounding the Caledonian Canal to the wonder of modern engineering that is the Falkirk Wheel to the tranquil stretches of greenery the Forth and Clyde and Union provide in our biggest cities. I hope you will enjoy reading about them and be inspired to visit for yourself, if you haven't already. (This is a resurrection of an ancient site that still exists here! The old site is now very outdated but still contains a lot of information that isn't on this new one yet. Over time I plan to migrate all of this information to the new site in some form or another).